The last few weeks have been “crazy busy” which is why I haven’t posted here much lately. However, it’s Thursday night, I’m sitting at home with a glass or two of wine, listening to the radio, and I’m determined to achieve some catch-up posts. When I say “crazy busy”, it’s mostly been work-related. There’s been a bit of socialising, but mostly it’s been work. You know that axiom that “if you want something done you give it to a busy person”? Well, I tend to be that person in my area. And I’m also the kind of person who instinctively says “yes” and then realises they have probably said yes to too much. Last year, I flat out refused to do a project because I knew I had already taken on too much. I should have said no to a couple of things I’m currently doing a few months ago, but I didn’t realise they would all come to fruition at the same time. Ah well. In the midst of all this, I actually ended up on the radio on Monday, as Richard Glover who presents Drive on 702 ABC Sydney lost his voice while on air. With about ten minutes notice I was in the presenter’s chair, and having to cram pretty quickly on the day’s news. The truth be told, I wasn’t entirely across the news of the day, as I’ve been working on these projects and, for the most part, listening to the ABC’s country music station, ABC Country. Ah yes, another project I said “yes” to. Thankfully, it’s a project which I’m really enjoying, as we transform the station from playing a lot of American country to one which mostly plays Australian country music. So yeah, listening to country music, and not really paying much to the news of the day, and then knowing I’d need to be across the news was a real “heart starter”. Thankfully, the production team of Emma, Lyndal and Lotta were really amazing and helped make it “work”. The program is online for a few more days, in case you would like to take a listen. The show starts off with Richard Glover, who you’ll hear him lose his voice until I take over about an hour into things. When I haven’t been at work, I’ve spent a lot of my free time in travel planning. I’m incredibly excited about my mid-year travel plans which will take me to Tokyo, Rome, New York, and of course, Stockholm. For the other cities, it’s the first time I’ve visited them, and am excited my friend Michaela and I will be sharing an apartment in Brooklyn for a week together. In the case of Stockholm, I’m excited to be there during Stockholm Pride, and of course catching up with people like Sandra and Robert. Sandra and Robert were in Sydney recently and it was terrific to catch up with them. 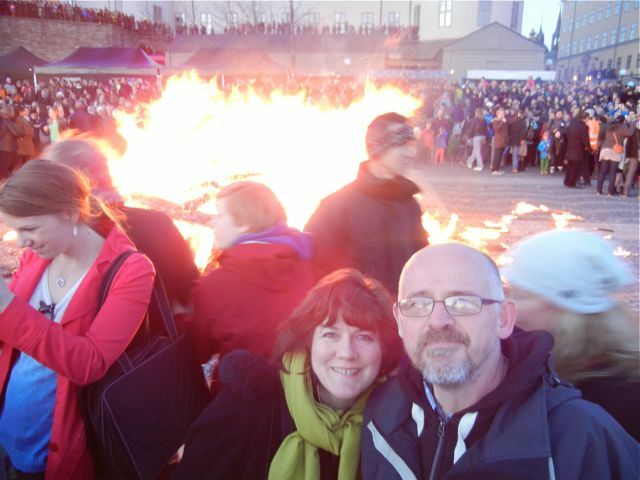 Co-incidentally, I’m writing this blog on Valborg’s Day, the annual bonfire and teenage “drunkfest”, at which we had a terrific time two years ago. Life has a wonderful symmetry, eh? You are a true professional at the mic. Reminds me of when Mr Faine had allergic reaction on air and his law advice person took over the programme with barely a beat missing. Not that I am suggesting a catch up, but we will be in New York about the 8th of July. Funny if we were there at the same time. The other famous on-air incident was when Andrew Olle was on air and had to get up and leave and his producer took over. Not long afterwards he was diagnosed with brain cancer and died very soon, which was very sad. New York? About a month later for me, so looking forward to reading your blog with hopefully some tips. Hello James, Great job jumping in like that.. you sound good and confident :-) I wouldn’t have guessed you weren’t up to scratch on the days news! Stepped in confidently like a Pro; which of course you are. All those years of experience coming to the fore. Thanks Matthew and Victor. Very kind.